Floyd technically has no medical training, so maybe poking Slice with a stick is the best treatment after all. Sorry this comic took me so long, but I am visiting family and went to my brother’s high school graduation (he was valedictorian!!). Also this was just quite an intensive page, period. Also, Lurkins’ arms are longer than humans’, proportionately. Their fingers reach about their ankles. (That and their legs are shorter, too.) It seems more obvious when they’re not wearing long loose sleeves somehow, so I’m just pointing it out so you don’t think my already tenuous grasp of anatomy has gone completely out the window. Doctor slice has a case of broken heart, we need to heal it by pokeing him with a stick. All my feels are givin to slice. Slice is just getting buried under an avalanche of feels. Mrs. Doctor lurkin seems to a little freaked out by the yank that floyd caused, but floyd’s say “YANK” all the time. on a lighter note, chapche as informed me that he had a remosnte ann. I feel better now. He just ripped out his IV, I’d be freaked out too! I really liked that bit, actually – being raised by medical professionals who enjoy kibbitzing about such things, I always grimace at IV yanks. Having a fictional character acknowledge what a bad idea it is to leave unplugged holes in your blood vessels is always nice. Came back from watching MiB3 (awesome movie) saw the new comic was up only increased by joy. (The joy has been doubled!) also yea it’s not nice to poke floyd with a stick, (unless you want to eat him) SHUT UP! Nice! I really want to see it, but maybe I should try and watch the first two again beforehand… I haven’t seen them in years! Oh man, this entire last set of comics have all been so adorable (and sniffle-inducing) can’t wait to see what happens with Slice! Hope you are doing well with work, my transition from uni to full time work left me reeling for a while, it took some time to work out how to balance it with everything else. 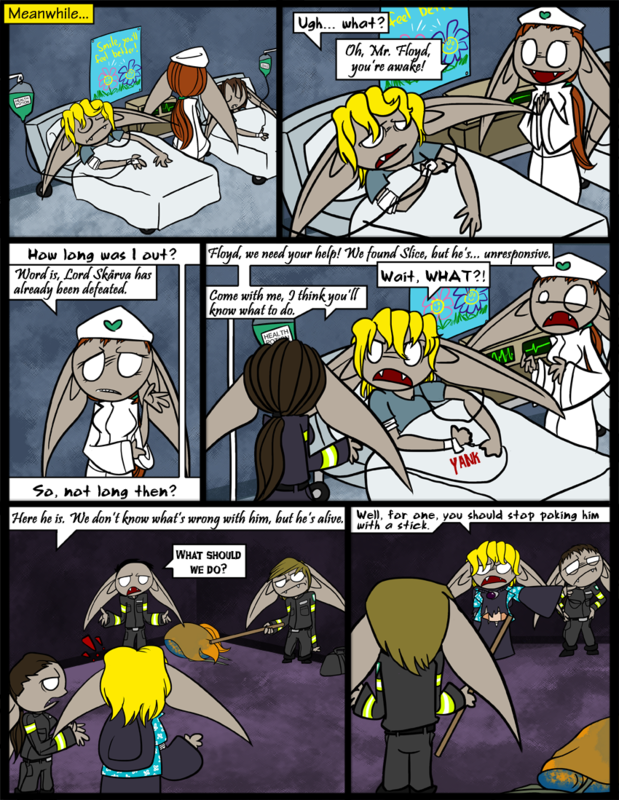 Yeah, so many Lurkins in this comic, it’s just a tangle of ears. Each panel is like 30% ear. I do enjoy working life… mainly the money, and being able to not worry about much else once I get home. I just need some time to catch up, get ahead with the comic, etc. ok I just noticed I called Slice Floyd…I feel like an idiot I am kinda out of it today. I knew what you meant. And you’re right, it’s not nice to poke Floyd with a stick, or Slice, or anybody. capcha says she should be named Nurse Morris. Congrats to your brother! I barely graduated high school… not that I’m a bad student, I just failed some classes that were too hard for me. OH, in case you were wondering (since I bugged you about this earlier) I finally set up a home for my webcomic. whoa whoa whoa, you have a web comic and you didn’t tell me?! Por Que!?! I just started it last night, Kelly Nelly. Well, it launched last night, I’ve spent the past four days setting up the website. There’s not a lot up there now, but I’ll probably add more junk later. ok, ok i feel better now. And then The Fourth became a medical drama! Did I ever mention that Floyd is my favorite character? No, you didn’t! Floyd is wonderful, but of course I couldn’t possibly pick a favorite, myself! oh this is a sad one! poor guy has been down there that whole time? poor little slicey. if i could id hug you! Is there a right kind of stick? Maybe a magical healing rod… or a peppermint stick! That is a wonderful poster. Skarva should get one for himself. If Skärva went around smiling in a non-evil way, everyone would think he’d lost it. See: the last comic. Yeah. I put quite a few little details into this comic that I’m pretty fond of. floyd looks cool when he’s not wearing the cloak. Yes, I love drawing him without it. Stupid loose thing really throws off his style. I love the additional Lurkins and how they’re all branching out. That said, something bothered me about this one and I couldn’t figure out what it was. I racked my brains at work all freaking day and couldn’t figure it out. It was driving me spare. Then as soon as I opened it tonight, it clicked. THEY’RE WEARING DIFFERENT UNIFORMS. Does Tiberius know about this?! Oh yeah, it’s fine. You have to know which ones are the medics and the Respawners. The hero is never going to see them anyway, they work in the shadows after he’s past. It’s ok, I like it when you call him Tiberius. It sounds so foreign despite that being his name, because no one is on a first-name basis with him, no one. Victor’s (non-canon?) filler comic notwithstanding.